Independence Day is a great time of year and always patriotic. While we celebrate the birth of our country and independence we also look at ways to celebrate with family and friends. 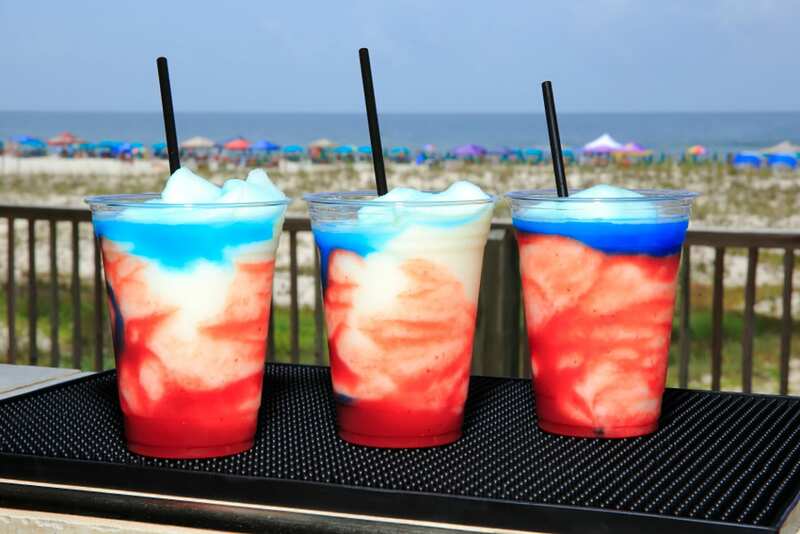 Backyard burgers and fireworks are a must and is all American, but you can upgrade you experience with a sandy 4th of July and let the Gulf, sand and tropical drinks be your red, white and blue for the weekend. Here is a list of places along the Gulf Coast with fireworks, celebrations and just a great way to show your patriotism. The Beach Club has a lot to offer for the Fourth of July. If you are staying on property there are a ton of activities for the little ones including a boat regatta race, their own personal 4th of July Parade and watermelon eating contests all before the sun goes down. If you are not staying on property you still have plenty of options here with the Village Lawn, nightly live music and entertainment for the whole family including food trucks to keep everyone happy, and then watch the fireworks light up the sky. There’s also an All American Cookout Buffet at Coast Restaurant with a prime view of the fireworks display on the beach at 9pm. The Wharf in Orange Beach has a Spectra light show like they do every night, but they have made some special improvements to their Independence Day celebration on July 2nd. Enjoy a patriotic theme light show with activities for kids including bouncy houses, face painting, rock climbing wall, petting zoo, surfboard simulator and more. End your Saturday night with fireworks at 8:45pm and still celebrate the rest of the weekend. The City of Gulf Shores knows how to throw a party, starting at 5:30pm on the 4th of July, have fun in the sand with a Salute to the Services and carnival like activities on the Gulf Shores Public Beach. See stilt walkers, face painters, balloon artists, snow cones and a live DJ all in one place and all honoring each branch of the armed forces. Fireworks will be shot from the Gulf State Park so most of Gulf Shores can celebrate together. Where ever you spend your Fourth there are options to optimize your family fun and #createhappymemories on the Gulf Coast.